Russian divers set a world record for diving under ice. In early March, Russian divers set a world record for diving under ice, reaching a depth of 102 meters in the White Sea where temperatures were -1.5 Celsius. What type of scientific work were they conducting and how did the expedition end? RBTH has the exclusive. Russian divers set a world record for diving under ice during an expedition to the White Sea that was a key phase in the preparation for larger Arctic research expeditions and part of the project called, "The 13 Seas of Russia.'' Its main objectives were to test underwater equipment and develop new methods for saving people at great depths. "We are constantly training in very complex conditions and at extreme depths," said the expedition's diving squad leader, Dmitri Schiller. "It is very cold there, and we face negative temperatures. The possibility of equipment breaking down is ten times greater than in normal conditions, and our adrenaline goes into overdrive." His diving squad was formed in 2010, and their main objective is to solve scientific problems in complex meteorological conditions. Their experience will be used to establish a mobile unit that will help scientists and specialists in the Arctic. The squad has been collaborating with the Russian Respirator Factory, and they have been testing Russian buoyancy compensators, regulators, and underwater computers. When conducting their record-setting Arctic expedition the divers also did some research for the Kirov Military Medical Academy. Thanks to the information gained during the expedition, special treatment tables will be created for divers. Is Russian equipment the best? "A few years ago most people believed it was impossible to dive deeper than 30 meters with Russian equipment," said Schiller. "But foreign equipment went to hell at that depth, whereas Russian equipment continued to function. Experience told us that it was necessary to understand the dangers of the cold water." With Russian equipment the divers were able to descend 97 meters off the coast of Antarctica, but they didn't set a record because they reached the sea bottom. Maxim Astakhov, one of the record-setting divers who reached 102 meters under the ice of the White Sea, said that underwater computers are particularly necessary for such dives. "They calculate all the temperature indicators, and they have mathematical decompression algorithms," explained another record-holder diver, Alexander Gubin. "There are many stress factors in cold water. Usually, it gets dark quickly in the Arctic seas. In fact, in the White Sea it’s dark already after 20 meters. The divers must listen to the computer signals. Batteries die quicker in cold water. And they must also withstand high pressure." Gubin said that Russian underwater computers not only withstood all the difficulties of the dive, but the divers even used them to record a short underwater video. "The main result of our expedition is clarifying what is needed to carry out work at such depths," said Schiller. "We select a certain depth based on the divers' capabilities, as well as the existing technical resources that allow them to warm up and survive the dive." Schiller added that cold fatigue can accumulate. 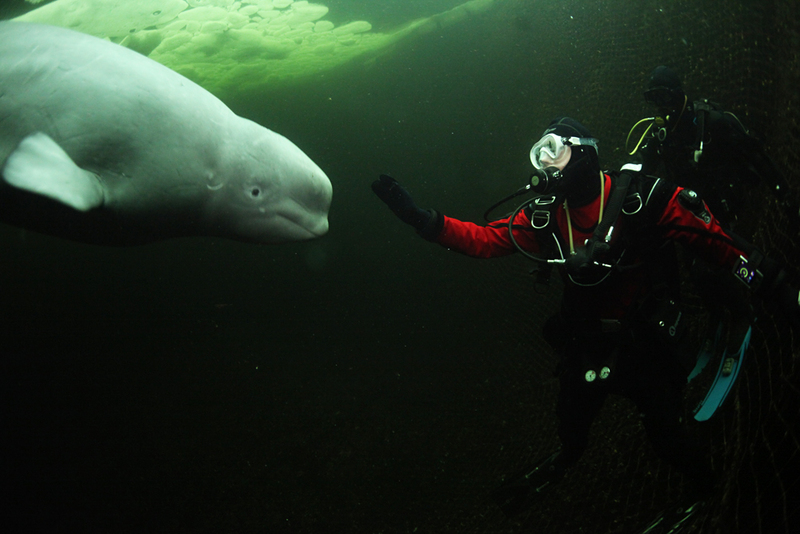 "When the divers overcool, they are not cold, they experience pain,'' he said. "It's as if their heads are tightened in a cold hoop and then ripped apart." The divers have another joint project with the biology department at Moscow State University, but for now it has not been successful. Scientists are studying the Tantulocarida microscopic crustacean parasites that live at the bottom of the White Sea. In winter they tried, but were unable to find them. "A part of our squad was equipped with special devices for collecting seabed soil in which the scientists wanted to find the female parasite," said Schiller. "The samples are now being studied, but the mysterious female has not been found." The Russian Geographical Society's underwater scientific research squad is named in honor of Alexei Leonov, the pilot and cosmonaut, and two-time Hero of the Soviet Union. It consists of divers, photographers, athletes, and scientists. The squad has set several world records, including the first winter dive of a human in the vicinity of the Pole of Cold (January 2013, Labynkyr Lake) and the deepest submersion of a diver in the Arctic (the Barents Sea, July 2015, depth - 111 meters).